Sony’s regular Xperia XZ2 is, to put it mildly, underwhelming — as capable as it is, there’s little to recommend it over its rivals. You can’t say that about the just-announced Xperia XZ2 Premium, though. The new handset preserves the 4K HDR visuals of its predecessor (this time on a 5.8-inch screen that’s 30 percent brighter), but the real centerpiece is the photography. Sony is hopping on the dual rear camera bandwagon with a focus on low light performance: it melds the input from a monochrome sensor (for contrast; 12MP, 1/2.3-inch, 1.55um) and a regular color sensor (19MP, 1/2.3-inch, 1.22um) to capture video at ISO 12,800 sensitivity, and photos at a whopping ISO 51,200. (Huawei’s P20 Pro is also claiming similarly crazy high-level ISO options in a forthcoming software update — we yet haven’t tested that either.) We’d be skeptical of Sony’s claim that the performance rivals pro cameras, but this might help you shoot with confidence in truly dark environments. The dual cams also enable the obligatory portrait mode (here called Bokeh) with soft-focus backgrounds, and you can snap shots with just the monochrome sensor if you’re going for the classic look. 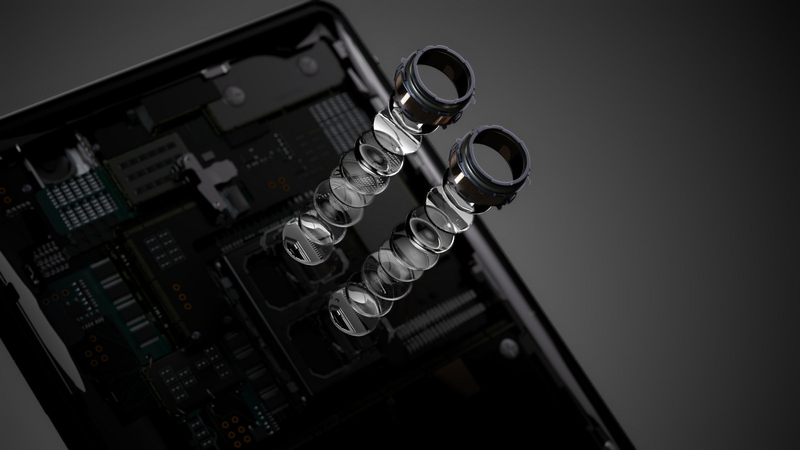 Sony is also promising a better front camera — you’re now looking at a 13MP, 1/3.06-inch sensor that Sony says can take quality low-light selfies. Most of the other features are carryovers from the standard XZ2, although that’s not entirely a bad thing. That means 4K HDR video recording (still a relative novelty), 960 FPS slow-motion video capture at 1080p, stereo speakers and a Dynamic Vibration System that promises more than the usual buzzes from haptic feedback. The Premium is still running a Snapdragon 845 processor, but there’s now 6GB of RAM (up from 4GB) to help with the extra performance demands. When compared to the XZ Premium, we couldn’t help but notice that the XZ2 Premium comes in at a whopping 236g, which is a notable jump from its already-bulky predecessor’s 191g. You do get an extra 310 mAh worth of battery juice (not to mention the secondary rear camera), but that’s hardly a convincing justification for such a weight gain. Sony ships the new handset “globally” in the summer. There’s no word on a US launch or pricing, although it’s bound to be expensive when the garden variety XZ2 goes for $800 in the US (£699 in the UK). With that in mind, this could be the XZ2 variant to get. Its camera implementation and 4K HDR display help it stand out at a time when differences between phones are becoming indistinguishable.